I cannot wait for our new bedroom! It's not large by any means (~11'x14'), and with the floor-to-ceiling windows, and an exterior door to the patio, we don't have a ton of wall space. The plan is to build all of our clothes storage into closet, so all we need in our room is our bed. And there maybe a little spot for our desk, but that can also go in the spare room. We have decided to (finally!) get a king sized bed when we move, which will be awesome. The not-so-awesome part? Finding a original MCM king sized bed. Apparently, people in the 1950's loved their full sized beds and kings are a rare breed. Makes sense; people were much thinner back then, and we all know how tiny the bedrooms were. We are going to continue our search, but if we don't find an original, I have a new one picked out! As for the colors, it started with navy blue walls. It will be a dark, true navy, but with three small windows, two floor-to-ceiling ones, and the exterior door with windows in it, I think we will get enough sunlight to make it NOT feel like a cave. Also, Greg did NOT hate the idea of doing a navy & white chevron wall behind our bed. It's a little bold for my plain-jane taste (when it comes to wall color...), but I'm excited that he didn't veto it right away. The floors will be a natural, light wood. And the baseboards will either be matching wood, or white - we haven't decided on that part yet; we keep going back and forth. We are not trimming the windows or doors, they instead will be wrapped in drywall for a cleaner, more modern look. I've gone a little graphic-crazy with our linens. I had ordered a lovely set earlier this week, but got notified today they were on backorder until May and they had canceled my order. Which meant I went with my second choice of the Jonathan Adler ones, which happened to be on sale today when I placed the order! 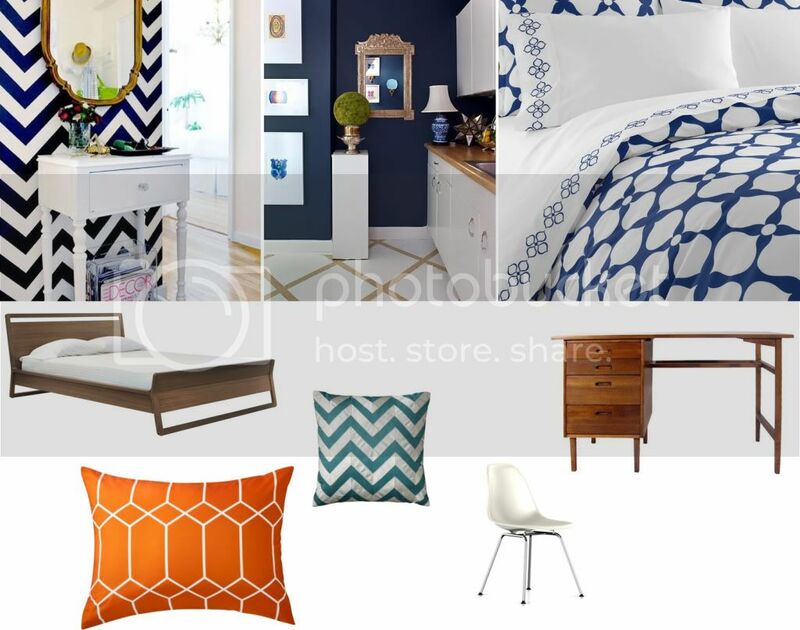 I was at Target earlier this week, and found some fun orange & white shams, which I think will be a fun accent with the navy duvet, and a turquoise chevron throw pillow for a pop of 2013. I am still digging chevron. Right now, I was thinking of putting our MCM desk in the room, paired with one of our Eames shell chairs in off-white. If it doesn't end up going in there, there is a small spot for it in our guest room. We also have a white painted MCM dresser that could go in that spot - might be cute with the navy walls. See? Lots of random furniture to find a spot for! As far as accessories go, there isn't much room for little things. We will need some sort of artwork and/or family photos. I'd love to hang something large above our bed at some point. I have so many wonderful images of our son, Eames, I can see a large black and white photo above our bed in poster size! (24"x36"). We will also need some rugs in there to give it a cozier feeling. While I LOVE wood floors, I prefer something soft under my feet when I wake up! Love the desk! If you're interested, I'm in Michigan and I have a gen-yoo-ine 1950s king-sized headboard, from the Drexel Declaration (catkins) line. Not mint, but "good vintage" condition. You are kidding me, Zoe?!? Can you email me a photo or two? We are certainly interested. Done! Let me know if you don't get an email from me. I linked to a picture of the headboard that's currently for sale on eBay (but for a lot more than I'm asking).